The Hearthstone Champlain heats up to 1,800 sq.ft. This perfect zone heating solution comes in matte black or enamel brown. 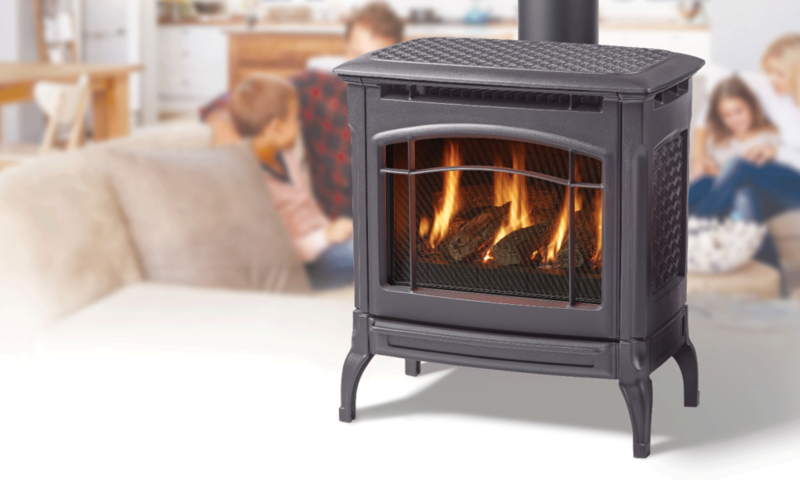 The Greenfield™ large cast iron gas stove is a true revolution in stove design. Combining clean lines, graceful proportionality and traditional cast appeal, this stove can be considered a freestanding fireplace! 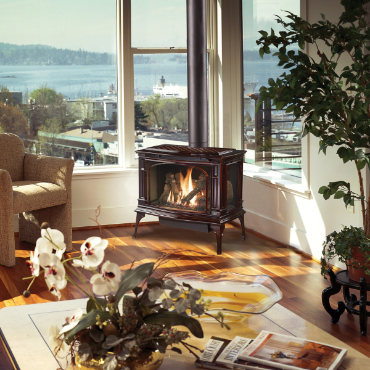 The number-one feature of the Greenfield is its massive 749 square inches of high quality fire-viewing ceramic glass! The three-sided wrap around glass design allows you to enjoy the stunning fire display from any angle in the room, which showcases the award winning Ember-Fyre™ burner with its incredibly realistic, high-definition log set and yellow flames. Another amazing feature of the Greenfield is its downward pointing adjustable accent lighting which beautifully highlights the log set and interior of the stove, whether is heat is on or off. The clean, modern lines of the Ultimate Gas stove wrap around the realistic gas fire available today. This fireplace can provide 40,000 BTU of high efficiency heat for large living areas but can be turned down to enjoy the fire view with less warmth. Warm up your kitchen, bedroom or den as you lower heating bills with the efficient and versatile U39 direct vent gas stove.